For a comparison of parables with other stories, see Traditional story. For a geometrical figure with a similar name, see Parabola. 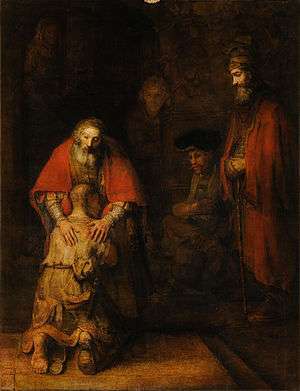 The Return of the Prodigal Son, by Rembrandt. A parable is a succinct, didactic story, in prose or verse, which illustrates one or more instructive lessons or principles. It differs from a fable in that fables employ animals, plants, inanimate objects, or forces of nature as characters, whereas parables have human characters. A parable is a type of analogy. Some scholars of the canonical gospels and the New Testament apply the term "parable" only to the parables of Jesus, though that is not a common restriction of the term. 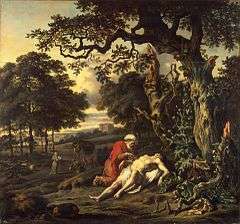 Parables such as "The Prodigal Son" are central to Jesus' teaching method in the canonical narratives and the apocrypha. The word parable comes from the Greek παραβολή (parabolē), meaning "comparison, illustration, analogy." It was the name given by Greek rhetoricians to an illustration in the form of a brief fictional narrative. Parables are often used to explore ethical concepts in spiritual texts. The Bible contains numerous parables in the gospels section of the New Testament (Jesus' parables). These are believed by some scholars (such as John P. Meier) to have been inspired by mashalim, a form of Hebrew comparison. Examples of Jesus' parables include the Good Samaritan and the Prodigal Son. Mashalim from the Old Testament include the parable of the ewe-lamb (told by Nathan in 2 Samuel 12:1-9) and the parable of the woman of Tekoah (in 2 Samuel 14:1-13 ). Parables also appear in Islam. In Sufi tradition, parables are used for imparting lessons and values. Recent authors such as Idries Shah and Anthony de Mello have helped popularize these stories beyond Sufi circles. Modern parables also exist. A mid-19th-century example, the Parable of the broken window, criticises a part of economic thinking. Parable of the Good Samaritan, by Jan Wijnants (1670). A parable is a short tale that illustrates a universal truth; it is a simple narrative. It sketches a setting, describes an action, and shows the results. It may sometimes be distinguished from similar narrative types, such as the allegory and the apologue. A parable often involves a character who faces a moral dilemma or one who makes a bad decision and then suffers the unintended consequences. Although the meaning of a parable is often not explicitly stated, it is not intended to be hidden or secret but to be quite straightforward and obvious. The defining characteristic of the parable is the presence of a subtext suggesting how a person should behave or what he should believe. Aside from providing guidance and suggestions for proper conduct in one's life, parables frequently use metaphorical language which allows people to more easily discuss difficult or complex ideas. Parables express an abstract argument by means of using a concrete narrative which is easily understood. The allegory is a more general narrative type; it also employs metaphor. Like the parable, the allegory makes a single, unambiguous point. An allegory may have multiple noncontradictory interpretations and may also have implications that are ambiguous or hard to interpret. As H.W. Fowler put it, the object of both parable and allegory "is to enlighten the hearer by submitting to him a case in which he has apparently no direct concern, and upon which therefore a disinterested judgment may be elicited from him, ..." The parable is more condensed than the allegory: it rests upon a single principle and a single moral, and it is intended that the reader or listener shall conclude that the moral applies equally well to his own concerns. Medieval interpreters of the Bible often treated Jesus' parables as allegories, with symbolic correspondences found for every element in his parables. But modern scholars, beginning with Adolf Jülicher, regard their interpretations as incorrect. Jülicher held that Jesus' parables are intended to make a single important point, and most recent scholarship agrees. The parable is related to figures of speech such as the metaphor and the simile, but it should not be identified with them. A parable is like a metaphor in that it uses concrete, perceptible phenomena to illustrate abstract ideas. It may be said that a parable is a metaphor that has been extended to form a brief, coherent narrative. A parable also resembles a simile, i.e., a metaphorical construction in which something is said to be "like" something else (e.g., "The just man is like a tree planted by streams of water"). However, unlike the meaning of a simile, a parable's meaning is implicit (although not secret). Ignacy Krasicki, author of "Abuzei and Tair"
↑ "Difference Between Fable and Parable". DifferenceBetween.com. Difference Between. Retrieved 13 June 2015. ↑ David B. Gowler (2000). "What are they saying about the parables". What are they saying about the parables. pp. 99,137,63,132,133,. 1 2 Adolf Jülicher, Die Gleichnisreden Jesu (2 vols; Tübingen: Mohr [Siebeck], 1888, 1899). 1 2 3 John P. Meier, A Marginal Jew, volume II, Doubleday, 1994. 1 2 Fowler, H.W. (1965). A Dictionary of Modern English Usage. London: Oxford University Press. p. 558. See entry at simile and metaphor. ↑ George Fyler Townsend, in his translator's preface to Aesop's Fables (Belford, Clarke & Co., 1887), defined the parable as being "purposely intended to convey a hidden and secret meaning other than that contained in the words themselves, and which may or may not bear a special reference to the hearer or reader." However, Townsend may have been influenced by the 19th century expression, "to speak in parables", connoting obscurity. ↑ "A Tale of a Fairy Tale". shonmehta. Retrieved 2014-02-19. Look up parable in Wiktionary, the free dictionary. Wikimedia Commons has media related to Parables of Jesus Christ.